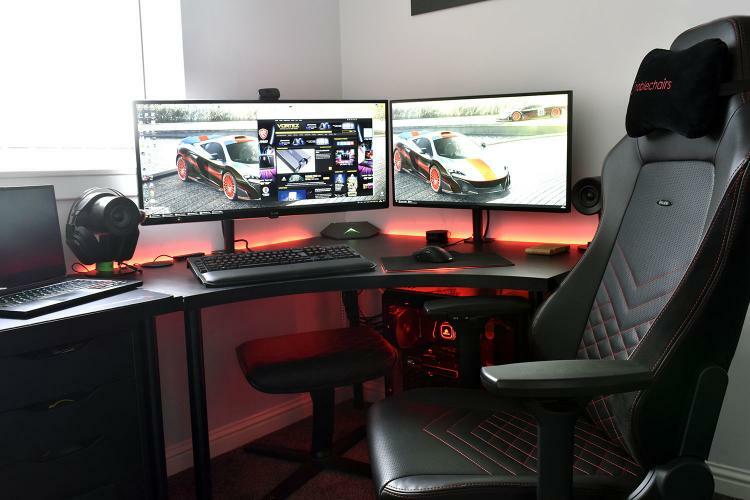 There's an old saying that says you should always invest in things that seperate you from the floor, such as shoes, mattresses and chairs; the chairs part is where we're going to focus today, to see if the £349.99 noblechairs HERO can improve your time spent at a PC, whether that's for lengthy gaming sessions or just a day at work. Now onto our third noblechairs review, we've tried and tested the noblechairs EPIC and ICON, two similar sized chairs with different styles. Today we look at the HERO, with several additions, most importantly of which is the increased size, now catering for the larger person. Padding is also increased, to help support heavier people, with a maximum quoted weight of 180KG (roughly 28 stone). As well as the increased size, we also get infinitely adjustable lumbar support and memory foam in the headrest, increasing comfort and useability. The elegant and beautiful designs that noblechairs employ on their ICON and EPIC series chairs has been carried through, with Nappa Leather and Real Leather options being available, as well as the PU Leather on our review sample. Chunky stitching and quality materials also help give the HERO series a premium feel. We've been using the ICON and EPIC chairs for a while now, giving us a solid benchmark to work from when comparing the HERO, which we've tested for around a month now. Read on to see what we thought.